You are at:Home»Herbs»Terminalia chebula Retz. 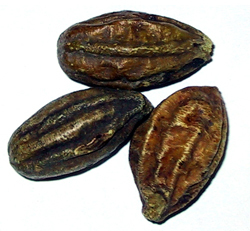 Latin name : Terminalia chebula Retz. Description : Halela would be extremely useful for your chronic acidity problem. These are matchless in revitalizing healthy digestive system and could successfully get you relief from acidity. These herbal products are purely natural, completely free of any side effects, and extremely easy to use. The herb has rejuvenative, laxative, astringent, purgative and dry properties. Paste made from the herb is effective in healing process of the wounds and ulcers. It also reduces swelling and acts as a cleanser. The herb relieves the eyelids in conjunctivitis. Regular gargling with the herb’s decoction helps in oral ulcers, sore throat and stomatitis. It acts as an active astringent and relieves bleeding and loose gums and also gums ulceration. It is also the main ingredient in Triphala, which is used to treat bleeding gums, hair wash and cleaning tooth in pyorrhea. Several gastrointestinal ailments such as ascites, tumors, enlargement of liver-spleen, piles, colitis and intestinal worms can be treated. The herb is a memory enhancer and is salutary in urinary stones and dysuria. The herb is effective in digestion and improves appetite. The herb has astringent and anti-inflammatory properties, it is beneficial in vaginal discharges such as leucorrhea and urethral discharges such as spermatorrhea. Recommended Dosage : 3 to 6 g powder of dried mature fruits. Contraindication : The fruit has no known warnings or contraindications.